It’s that time of the year again: Ironman peak season. I knew that I was there without looking at the calendar: a weekend that consists of a relaxing 60 mile ride and an easy 14 mile run is all too telling. Lucky for me, I’ve managed to string together a solid block of training since early May when I stopped traveling for work, and I’m approaching the busy season in top form. I set out for Sonoma very early Saturday morning for Golden Gate Triathlon Club’s Vineman Course Preview – one lap of the Full Vineman course, and the same route I’m riding on July 13 for Vineman 70.3. 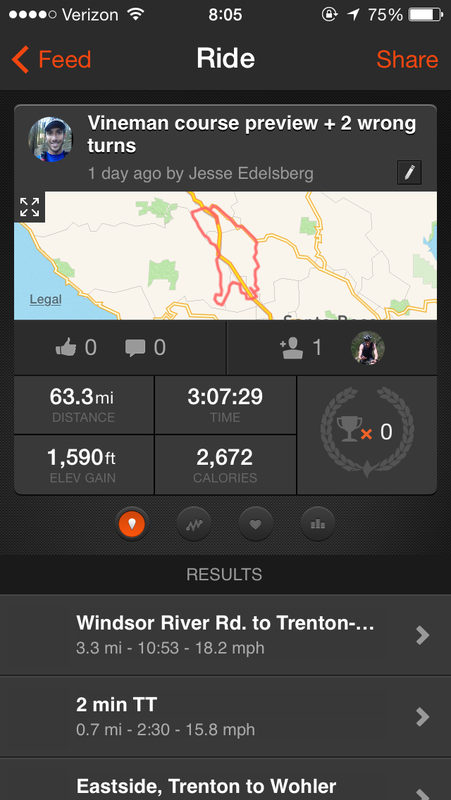 The rolling course is rated at roughly 1700′ of elevation gain – about half of Wildflower, and is known for fast times. On paper, a course like this plays to my strengths: it features rolling hills, one climb, and only a few turns. Of course – all this assumes that my bike is fully operational – which it almost wasn’t. 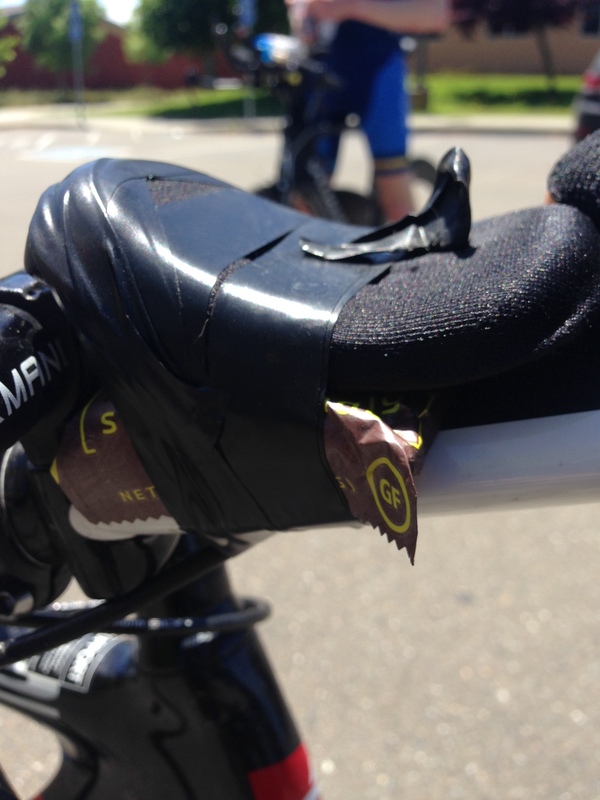 I discovered that a wobbly aerobar pad was actually a stripped thread – a roll of electrical tape and a Picky Bar for support later, I was ready to roll! We started off with an easy warm up for the first 15 minutes. Much to my surprise, we were averaging over 18mph without expending much effort; I knew we were in for a fast ride. 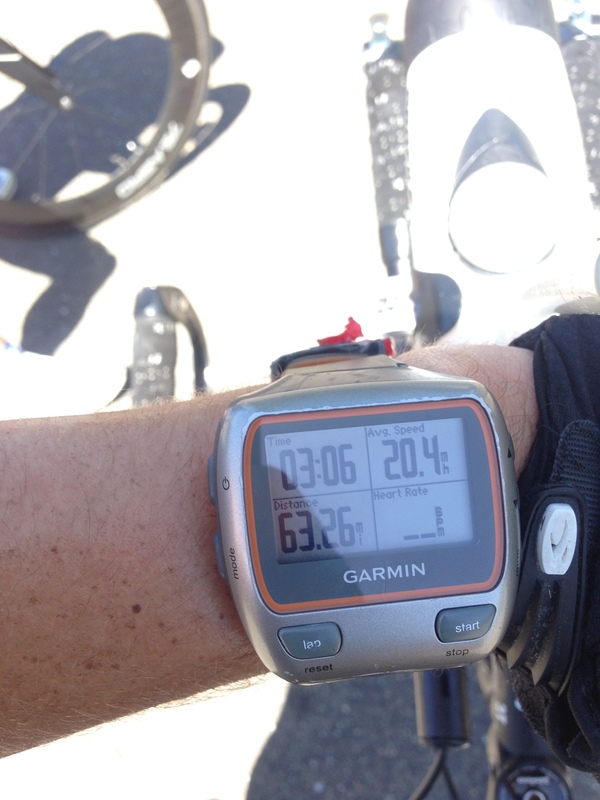 As we approached the meat of the ride, we pushed the pace to 21-22mph on the flats which felt like a 70% effort. 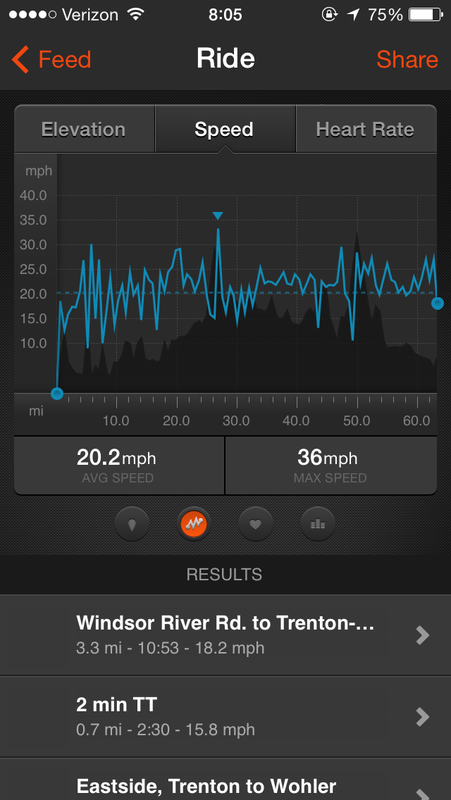 I was shocked to see that we were averaging 20+ mph at the 30 mile mark. After making a couple of wrong turns and tacking on 6 extra miles, we got back on course with 10 miles to spare ahead of Chalk Hill – the only significant climb on the ride. My fueling plan – Osmo Preload ahead of the workout followed by Osmo Active Hydration during, coupled with 2 Gu Roctanes and a Picky Bar, worked like a charm. I had plenty of energy when I hit Chalk Hill roughly 50 miles into the ride, and powered up it easily after riding much bigger hills in weeks prior. We bounced back immediately following the hill, and held a steady 22mph pace for the final 10 miles of the ride, logging the 63 mile loop in a shade over 3 hours. I hit the 56 mile split at 2:45 – 15 minutes faster than my previous 70.3 bike PR of 2:59 at Ironman Lake Stevens 70.3 last year – without race wheels, and without pushing hard. 1.5 miles of transition running later, we called it a day – albeit a big one. My goal on Sunday was much more straightforward – run 14 miles at an easy effort, ignore stats on the way out, negative split the way back. Following in Taylor’s footsteps after her 18 miler on Saturday, I opted to run a section of the San Francisco Marathon course – 7 miles out and back. I ran easy for the first 7 miles into the wind and up the hills, splitting 7 in 59 minutes. I knew the turnaround would bring both tailwinds and downhill stretches, so I went for the negative split, and logged the next 7 in 53 – hitting the 13.1 mark at 1:46. Perhaps the most encouraging part of the run was running up a massive hill that usually exceeds the 9:00 minute/mile barrier for me at an 8:25 pace. My 13th mile was my fastest, I bounced back well on Monday, and am really excited about the upcoming weeks! Train well!